All too often on these pages we document the loss of historic structures, and this one is relatively new compared to many that we have lost over the years. The Glacier Park Lodge is located on the TransCanada Highway in the Rogers Pass between Golden and Revelstoke. The lodge has been a fixture along this stretch of highway since opening in 19631. Countless travelers stayed here, ate in the restaurant, and filled up their vehicles at the gas station. That all changed on September 30, 2012 when the lodge closed its doors for good. 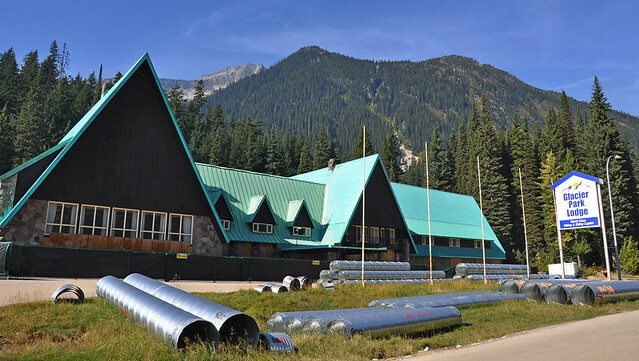 The original lease had expired in 2010 but the Lodge had been running on a month-to-month basis with Parks Canada before a series of compliance issues ended the arrangement. I won’t go into detail about the lawsuits. If you want to read more, the links in my Sources section offer a good place to start. Image retrieved from http://www.glacierparklodge.ca and does not belong to me. From its closure in 2012 until earlier in 2017, the Lodge deteriorated as a lack of maintenance, vandals, and explorers all took their tolls on the building in various ways. When we stopped here, the buildings were boarded up and secured behind construction fencing which eliminated any thoughts we might have had of doing a more in-depth investigation. We were forced to settle for some photos from the outside. I would have loved to see inside as the limited views we had from outside the fence revealed light fixtures and things still remain. They could have made some money by charging for tours of the interior but we know lawyers would never allow that. It would have been great to see some more creative solutions put forward from our elected officials rather than demolition but that would have been too much to ask. At least we got to see it one last time. I suspect we won’t be back before it is gone. Frankly, I’m surprised it lasted a full year since the demolition plans were formally announced. Farewell to a TransCanada Highway icon. This entry was posted in History, Travel and tagged British Columbia, Canada, demolition, Glacier Park Lodge, history, Parks Canada, Rogers Pass, TransCanada Highway, Vacation 2017. Bookmark the permalink. Great post Dan! Always wanted to stop there but for one reason or another didn’t find the time. Should have listened to my instincts and not the voice telling me it’ll always be there. Recall stopping there on roadtrips when I was a kid. Keep up the great work!